A curious question came up more than once on day two of the NADA convention: Will we see automated vehicle pricing sometime soon? When dealers asked the questioned, I took time to better understand the reasons that prompted it. In each instance, the dealers shared that they weren’t sure that the individuals who currently handle vehicle pricing are doing the job as correctly and optimally as they could—despite efforts to coach and train them. On some level, the dealers were also looking for ways to use technology to potentially cut the people costs associated with managing their new and used vehicle inventories. I think it’s also true that the automated pricing question owed, at least in part, to dealers seeing the full effects of their current used vehicle pricing strategy through the lens of Provision ProfitTime, which often reveals that dealers’ least-valuable investments are priced as if they were their most-valuable investments. I told the dealers that, yes, over time, we would likely arrive at a day when at least used vehicle pricing could be automated, as market data science and pricing tools evolve. But I also underscored that, until this day arrives, they would need to redouble their efforts to manage their pricing strategies with greater accountability and oversight and attune them to each vehicle’s investment value. As I noted in yesterday’s post, today’s market requires making hard decisions about some vehicles faster, and vehicle pricing often serves as the focal point or front line where you may need to face up to the fact that some vehicles can’t command the mark-up we may think they deserve. The role of VDPs: With all the focus on digital retailing, dealers asked if their efforts to drive Vehicle Details Page (VDPs) views was a tactic from yesterday’s online merchandising playbook. I shared that, even as digital retailing helps dealers complete more portions of a vehicle purchase online and market specific vehicles to targeted customers, VDPs still matter. They remain one of the key indicators of buyer interest in a vehicle. I also shared that how we think of VDPs will shift from offering details on vehicles to including deal-making capabilities. Reconditioning efficiency: vAuto’s new iRecon solution drove a lot of attention and interest from dealers here at the show. Dealers shared with me that they have simply grown frustrated and tired with amount of cost and time they spend getting used vehicles reconditioned and retail-ready. I did an informal poll when the conversation turned to reconditioning. Despite NADA’s recommendation that dealers should recondition vehicles in 72 hours or less, the turnaround time at many dealers often runs twice as long or longer. Trade-in pressure: I heard frequent concerns about the high costs of acquiring auction inventory, and outfits like CarMax siphoning trade-in opportunities from some markets as they advertise “we’ll buy your car” programs. The trends are rightfully leading dealers to re-examine and improve their appraisal and trade-in processes. 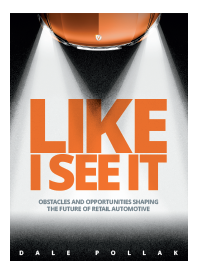 It should be noted that the concerns are less profound for dealers who meet or beat the goal of achieving at least a 50 percent look-to-book ratio as trade-in opportunities arrive online, or in their service lanes and showrooms. My feet are telling me we’re nearing the end of another NADA convention. I’m looking forward to the final day on the floor.